'Won't make it at MCFC', 'trash' - Most Man City fans tear into potential Jorginho alternative | The Transfer Tavern | Where football transfer rumours fly or die! 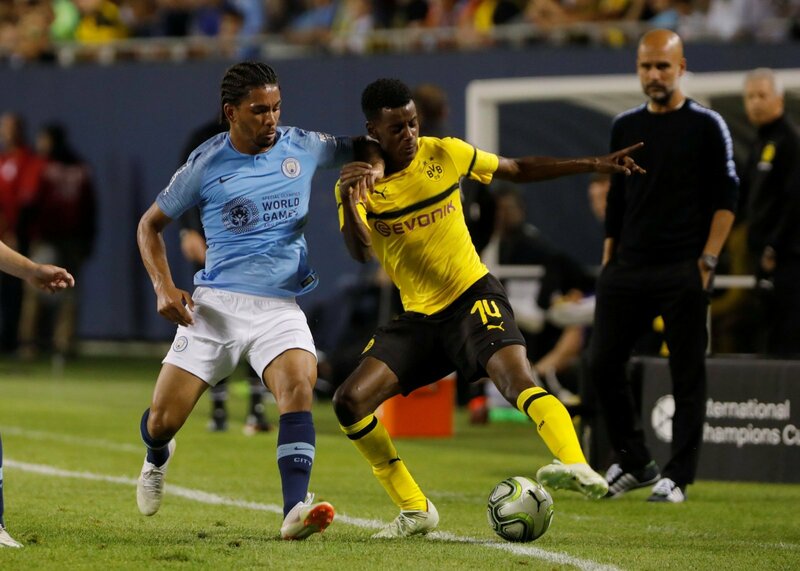 Manchester City got their pre-season underway last night against Borussia Dortmund in Chicago with a 1-0 defeat after Mario Gotze netted a first-half penalty. Pep Guardiola’s pre-season preparations have been far from ideal with the vast majority of his squad partaking in the World Cup in Russia, and now the tournament is over he will need to work hard to ensure his players are raring to go when the season kicks off in 3 weeks time. Riyad Mahrez made his first appearance in a City shirt last night following his £60 million transfer from Leicester City. But despite the fact that Guardiola seemed hell-bent on completing a 2nd big-money transfer this summer with the signing of Jorginho, he ultimately failed in his pursuit due to Maurizio Sarri’s arrival at Chelsea. Plenty of rumour linking City with some of the best central midfielders in Europe have swirled every since Jorginho’s u-turn, but Guardiola may yet turn to players inside the club in a bid to find someone suitable to slot into Fernandinho’s shoes when needed next season. The likes of Fabian Delph, John Stones and even Kevin De Bruyne are worthy candidates to replace the consistently reliable Brazilian, but Guardiola gave the 20-year-old Douglas Luiz a chance to impress last night in a holding midfield role. Luiz recently returned to the Etihad following a loan spell with Girona in La Liga in which he played just 295 minutes of top-flight football and, based on the reaction of the City supporters to his performance last night, it’s easy to see why he failed to break into the first-team in Spain. Luiz’s credentials to slot into City’s first-team next season were discussed by plenty of supporters on twitter, and the vast majority arrived at a similar conclusion: Luiz is simply not good enough to play for the club. Naturally, the supporters would be foolish to jump to a conclusion based on one pre-season performance, but it’s clear that the young Brazilian has plenty of work to do on the training ground if he wants to change the opinion of the supporters. He is a strong candidate for the worst DM city ever has, along with Rodwell. Definitely no. A million miles away.